Mom Here. The Furry Bambinos said that I could post today in honor of Clyde. Today is the anniversary of the day that Clyde came into our lives, back in 1992. We adopted Clyde as a tiny kitten, and compared to our other cat Mohawk, Clyde was “little one”. Clyde soon outgrew Mohawk, weighing nearly twice as much! We adopted Clyde on a sunny spring Saturday. David drove while Clyde frantically tried to get out of the cardboard carrier box. When I let Clyde out “just for a minute”, Clyde immediately scrambled over to David and climbed into his lap. Clyde loved David completely from Day One. He loved me, too, but he had an especially strong bond with “Daddy”. He always had such a sweet expression on his face. Clyde taught us how to play fetch with him. We got a yellow plastic spinny toy that looked like a wheel out of a cereal box. When we rolled it across the floor, Clyde would go running after it, retrieve it in his mouth, carry it back to us while yodeling (“mrrooww, mrrooww-ooo”). Then Clyde would drop his toy into an empty Kleenex box. That was our cue to congratulate him and then send it spinning again across the room. Clyde reallly liked to help me with my classwork. 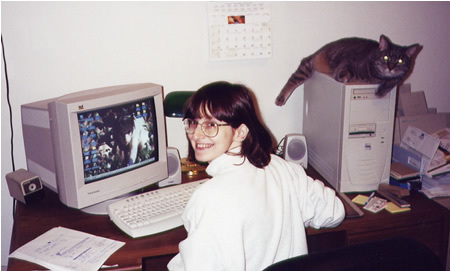 Although I worked full time, I occasionally took some classes at the university where I worked. Clyde would assist me while I studied. 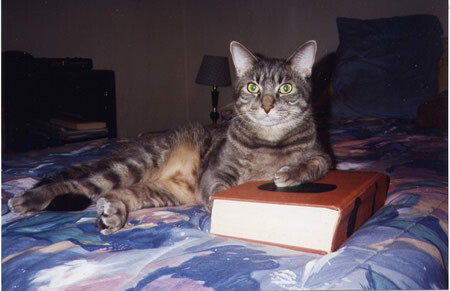 This photo is Clyde posing with a college dictionary. Note the serious expression on his face. We originally adopted Clyde as a companion to our cat Mohawk, but Clyde soon asserted himself as Top Cat. Despite this pecking order between Mohawk and Clyde, it was Clyde who was the timid one when guests arrived. Clyde would make himself scarce as soon as the apartment buzzer rang. Clyde really liked to spend time with us, and would follow us from room to room. Luckily, Clyde usually would sit nearby, rather than ON our lap. He was just too big for my lap! Clyde also liked to assist with laundry. 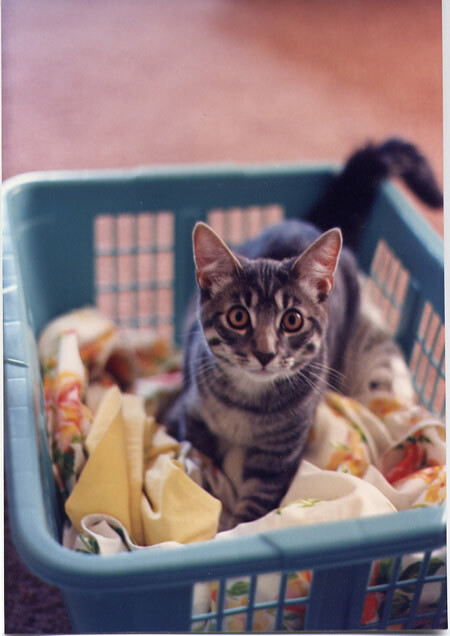 We have lots of photos of Clyde in laundry baskets, among clean laundy. This photo is one of our favorites. In the picture above, you can clearly see Clyde’s white “foofles”. Foofles are the area on a cat’s face just below the nose and above the upper lip. Clyde’s foofles are white. Clyde’s other really cool facial marking are his extra set of “eyes” above his real eyes. When Clyde’s real eyes were closed, it looked like his “extra eyes” were open. Clyde’s “extra eyes” are the white and black markings just above his real eyes. See what I mean? Do any of you tabbies out there have “extra eyes”? Clyde was an unusually talkative cat. He especially enjoyed conversing with us while we prepared his meals. In fact, his whole mealtime routine made Snoopy’s suppertime dance seem pathetic. Clyde would begin by rubbing up against us, sashaying back and forth, and rubbing the can of stinky goodness with his chin. He would sing to us, and when we responded with a comment or question, Clyde would continue the conversation. We had to feed Mohawk and Clyde separately because Clyde would just about inhale whatever we fed him, then go after Mohawk’s food. Dr. Keith, one of the V-E-T’s the kitties have seen, refers to this as being a “food bully”. But he was just a really big boy with a huge appetite. We fell in love with Padre, but remembered our desire to adopt two siblings. Enter Panda Bear and Meerkat. Panda Bear, always the outgoing one, pawed at us through his cage. When we opened the cage door, Meerkat hung back, but Panda Bear literally leapt into my arms. We were not sure we wanted to go from having zero cats to having three cats. The main concern I had was would the three cats get along with each other. The main concern David had was would my allergies and asthma handle such an abrupt furry transition. We debated and discussed, went for a drive, came back later, and filled out the application to adopt all three kitties. So it’s because of Padre’s resemblance to Clyde that The Furry Bambinos are now part of our fambly. Thanks for indulging me while I honor Clyde’s memory today. Filed by The Human Parents on May 2nd, 2009 under Clyde, Gotcha Day, Love, Mom's Posts, The Boys. Leave a Purr or Hiss. What a lovely story about Clyde and what a wonderful and pretty mancat he was! Momma got all leaky eyed while she read Clyde’s story to us! Clyde had really wonderful markings on his face! His extra “eyes” and foofles are cool. It’s a great tribute to him that he paved the way for the Furry Bambinos. I had the pleasure of meeting Clyde when he was distinguished older gentleman. Rest in peace, Clyde! Happy moms day to you. We loved the post about Clyde, he sounds like a good dude. 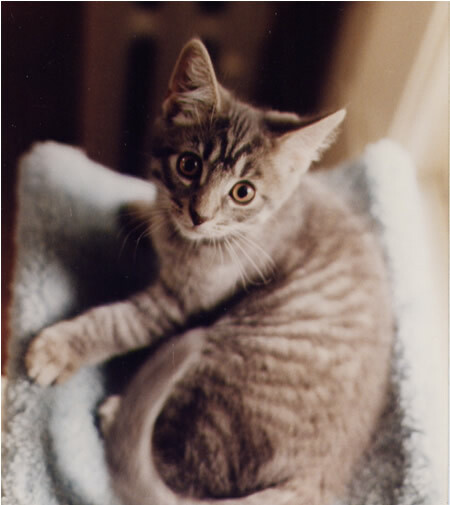 We had a lovely tabby cat called Puss and she is an angel now. Like Clyde, she let my mum open her heart to another cat and share all that love. We know Clyde is your angel boy, and will be looking out for all of you. What a handsome boy – that Clyde! We’re so glad that you shared his story and that you adopted Padre, Panda Bear and Meerkat. We like to read about their adventures! Clyde sounds like a wonderful kitty. We’re glad you had so many happy memories of him that you opened your heart to adopting more. We’re told Panda Bear and Meerkat are having a birthday today, so we stopped by to wish them a very Happy Birthday! And a very belated one to Padre! What a wonderful story! We would have loved to meet Clyde, but we’ll be happy to be your friends as well. Those extra eyes are super cool! Happt Gotcha Day to Meerkat and Panda Bear – what a lovely post in memory of Clyde. I loved the extra eyes – his are really noticeable! Awwwwww……that a a great remembrance of Clyde! That is so cool the second set of eyes he had!! Thanks you for sharing Clyde’s Story with us!! What a lovely story about Clyde! I think he sent all three of your fur children to you. Oh dis furry goods bout Clyde! Fanks fur sharin. Him was a good boy! Him looks like our Maxie boy who iz too bigs fur a lap now too! Thank you for sharing Clyde’s story with us. I love his extra eyes. He sounds like a wonderful cat. I’m glad that he paved the way for your adopting Padre, Meerkat and Panda Bear.